The environment we work in can have a big impact on how effectively we work. This is why decorating your workspace is a great way to improve office productivity. Stylish offices that employees enjoy spending time in can lead to happier, more engaged, and more effective workers. Making your workspace a little friendlier and fun doesn’t have to be a major undertaking, either. A few small changes can result in great things for the well-being of your employees. If you’re searching for some office design inspirations that will get your employees inspired too, here are three of the best decorations to help improve office productivity. An office space designed with a dedicated color scheme will feel much more lively and inspiring than one that is a wash of white, beige, and gray. To bring some life to your decor, try decorating your office with images that feature bold colors. These can be in the form of artwork and graphic prints, but can also include a variety of inventive office window graphics for any of your larger windows or glass surfaces. Window graphics, like the kind we produce here at Digital Window Graphics, can outfit your office with bold and exciting colors, eye-catching geometric shapes, and even customizable designs that are unique to your office culture and aesthetic. As for office color ideas, try to keep it light. Dark colors will make an office feel smaller and less inviting, while brighter shades like orange, teal, and yellow generally give the room a cheery feeling. Cool colors like green and blue are soothing and easy on the eyes and are popular choices to boost creativity and increase focus. Not only does a little bit of greenery around the office help invite in more color, but it also provides a nice infusion of liveliness. 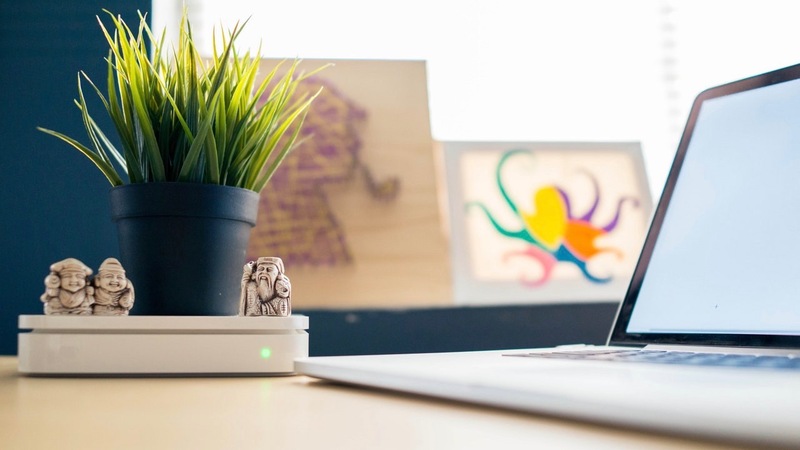 Humans are naturally attracted to and inspired by the outdoors, and having a few growing plants around the office and at desk workspaces will help invite in a more natural feeling. Plants are also known to improve air quality and filter out harmful pollutants, which can lead to an overall healthier office atmosphere. Of course, it’s important that someone waters and cares for any of your office plants, but there are a variety of plants that look great and require little maintenance. For plants that are easy to take care of, don’t require much light, and look great in an office space, look into incorporating spider plants, English ivy, peace lilies, or a snake plant to your decor. There is a known connection between clutter, procrastination, and general feelings of anxiety and stress. If your employees’ workspace could use some tidying up, the best way to improve office productivity is to introduce some good-looking storage options. There are many options for storage that are both stylish and functional, but the most effective for your space depends on the type of clutter you’re surrounded by. If the office is plagued by loose objects that can never seem to find a home, try finding some colorful storage trays and a set of shelves to store them in. For general desk clutter, pen holders and cable organizers can help wrangle even the most distracting of issues. And if paperwork is the problem, it’s hard to go wrong with filing cabinets that look good and make organization easier. Your office will look neater as a result and your employees will have a clean space where they can focus on productivity instead of distractions.